What is a height sensor? A height sensor (length sensor) is a small appliance which sends an electrical signal to the control when a tool is being used from above. It can be either permanently or temporarily installed. When it is permanently installed, it is used to measure the length of the tool after a tool has been changed or replaced. This version is called a tool length sensor. It can also be used as a mobile device to determine the height of the work piece surface and to automatically set the zero point. Unlike the direct „scratching“ of the work piece surface or the above mentioned „paper method“, this is a considerable reduction in workload. The sensor is attached to the control and positioned on the material surface. The tool will proceed vertically over the button. 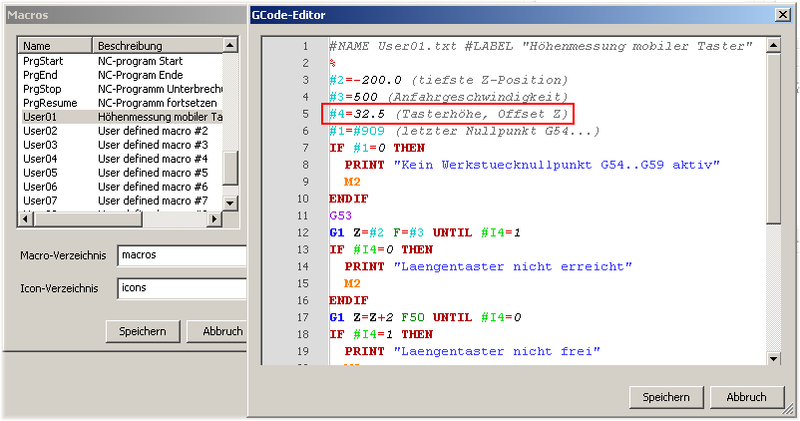 Then a macro will be executed, i.e. 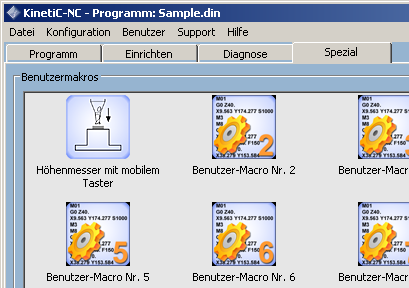 a small program will be started which automatically carries out the measurement. The tool will proceed slowly along the button until it reaches the switch point. 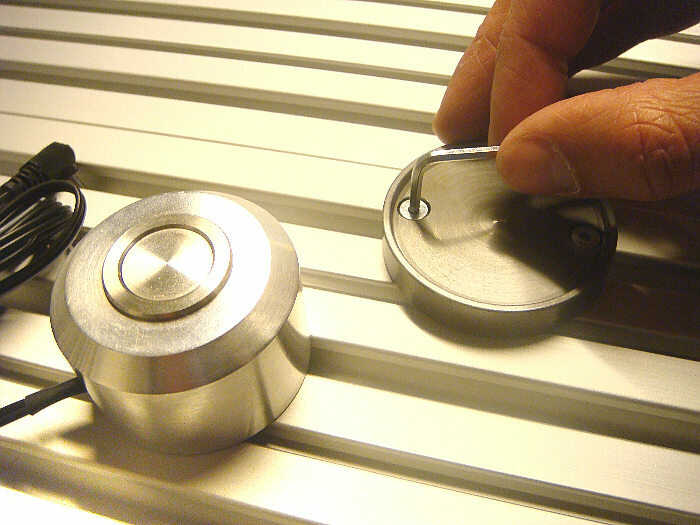 The height of the button itself from its surface to the bottom of the casing will be measured from the position reached and the result will be saved as the work piece offset’s Z coordinate. That means that the coordinates‘ zero point are right on the work piece’s surface. The height sensor is usually connected to an extra socket on the machine or to the CNC controller. You can find more detailed information in the documentation about your control hardware. In order to be able to use the macro for measuring height, you have to import it first. Go to „File – Import settings“ and under „Standard Parameters“ in the subfolder „Add ons„, select the „Macro_LengthProbe.ini“ file. 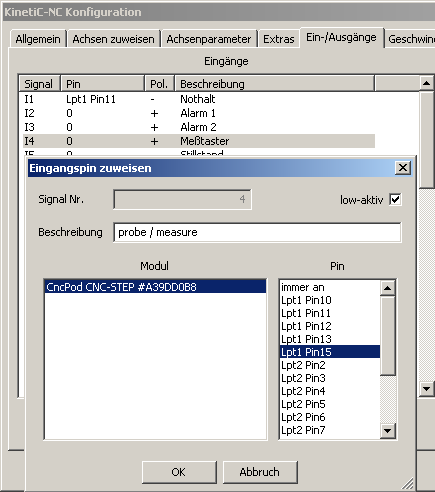 By doing this, you will import the required macros as well as assign the entry for the probe with the standard pin assignment. It is very important that you test the button for correct functionality before you use the length probe for the first time. To do this, go to the diagnosis page. In the inputs (above right), one entry „Measurement Sensor“ should be visible with a little box on the left. 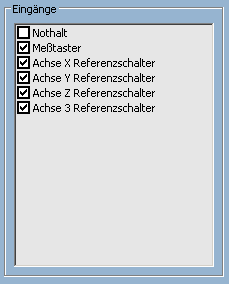 Normally, you cannot tick this box. Now press your hand on the switch and you should see a tick appear. If nothing changes, then either the switch is not correctly connected or the signal has been assigned the wrong pin. If the situation is reversed (the tick is visible when the switch is not pressed), then you have to invert the signal. You can do this by going to „Configuration -> Machine ->Input/Output and clicking on the „Measurement Sensor“ and then „Change“. To invert the signal, change the status of the „Low Active“ option. Now you will have to determine the height of the sensor and enter it into the macro. Position the sensor on the material and the tool on the sensor. If you start the macro now (by double-clicking on „Measure height with mobile sensor“ on the „Special“ page), the measuring process will be performed. If you remove the sensor now and proceed further with the tool to where it just touches the material, the Z coordinates will display the (negative) height of the sensor (precisely taking the distance of the switching point down to the floor, i.e. the entire height minus the actuation path). If for example your sensor is 33mm high, and the distance to move the switch is 0.5mm, the the coordinate display for Y is now at -32.5mm. Enter this value in positive into the G79 macro at #4, as demonstrated in the adjacent figure.